We are back for Round 2! Thank you to everyone in attendance at our first trivia night! Game of Thrones won’t return until 2019 and The Winds of Winter is nowhere in sight. While you dream of spring, why not fill the Drogon sized hole in your heart with whiskey and trivia? 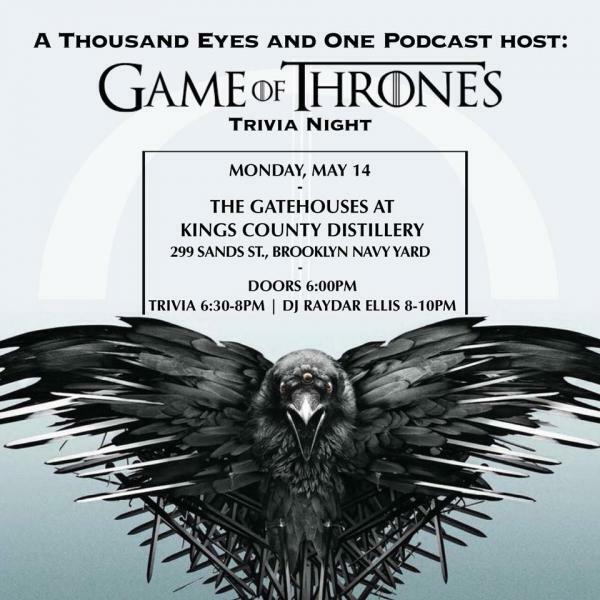 Join A Thousand Eyes and One Podcast at The Gatehouses at Kings County Distillery for a night of trivia! There will be whiskey and prizes, and music by DJ Raydar Ellis. Test your knowledge of Game of Thrones and A Song of Ice and Fire and see if you truly know nothing. You can find links to all of our past episodes at thousandeyespodcast.wordpress.com.